The sidewalks (i.e. 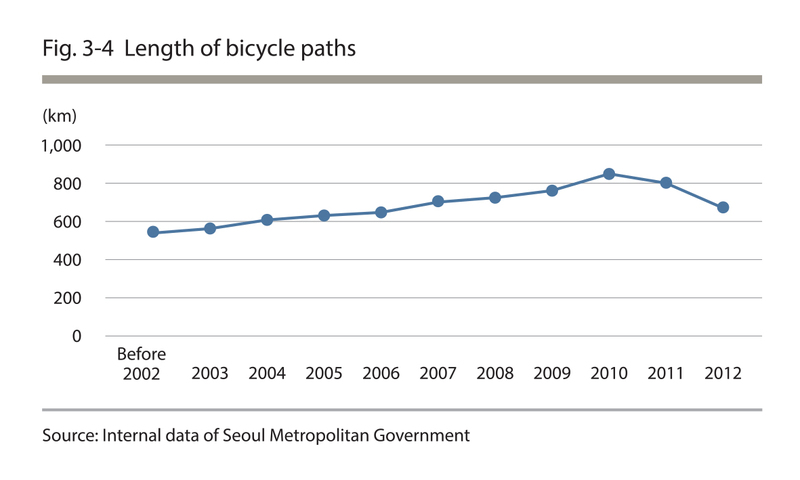 pedestrian paths) in Seoul in 2011 extended 2,788,619m in distance, which was 413,860m longer than in 2002, and they were 10,249,537㎡ in total area, which was 2,087,520㎡ larger than in 2002. 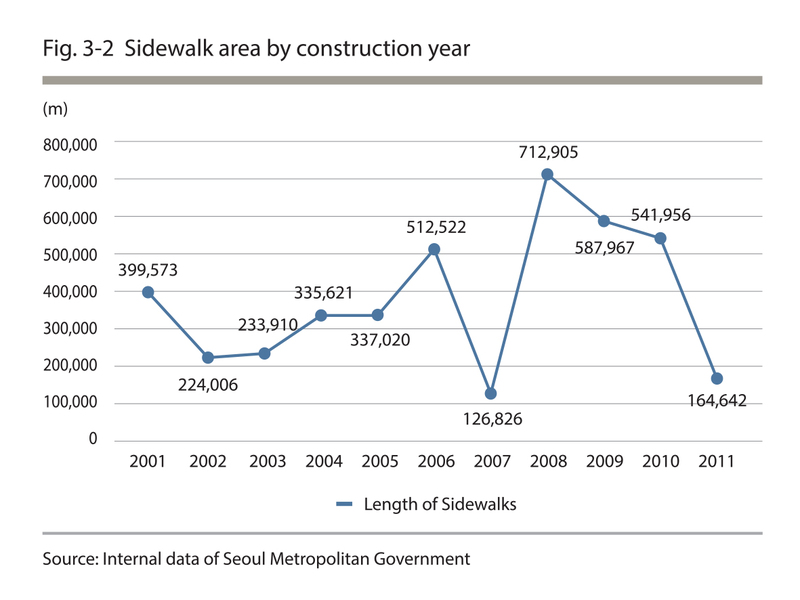 There was a significant decline in sidewalk construction starting in 2000. 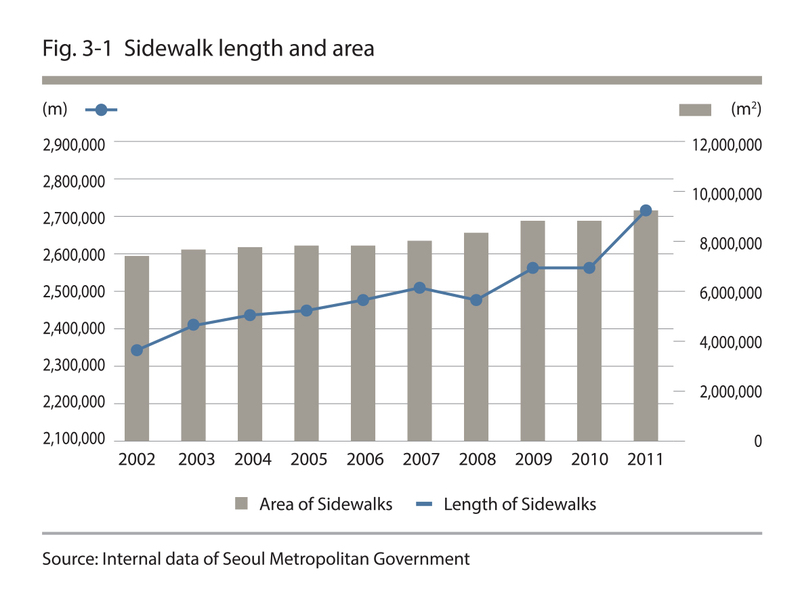 Sidewalk construction work increased substantially with a large-scale sidewalk improvement project implemented in 2008, but it has been gradually declining ever since. 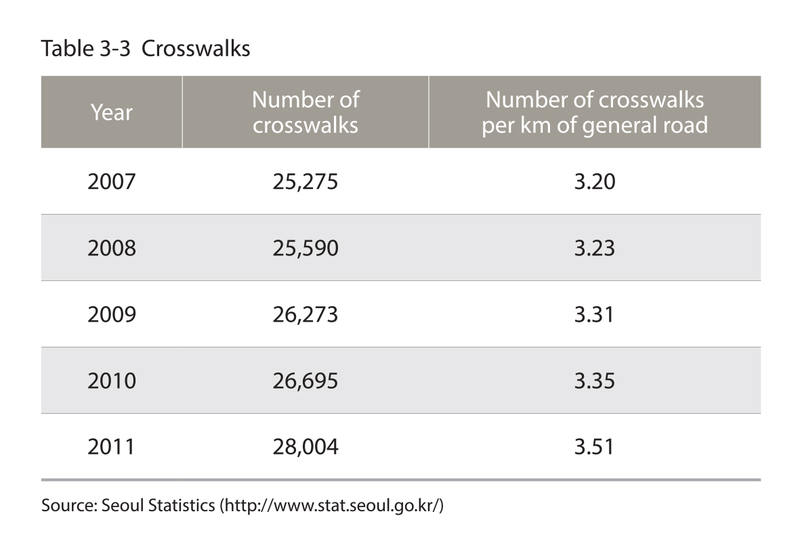 As of 2011, there are 28,004 crosswalks and 3.51 crosswalks for every kilometer of general road with an estimated interval of 285m between the crosswalks in Seoul. 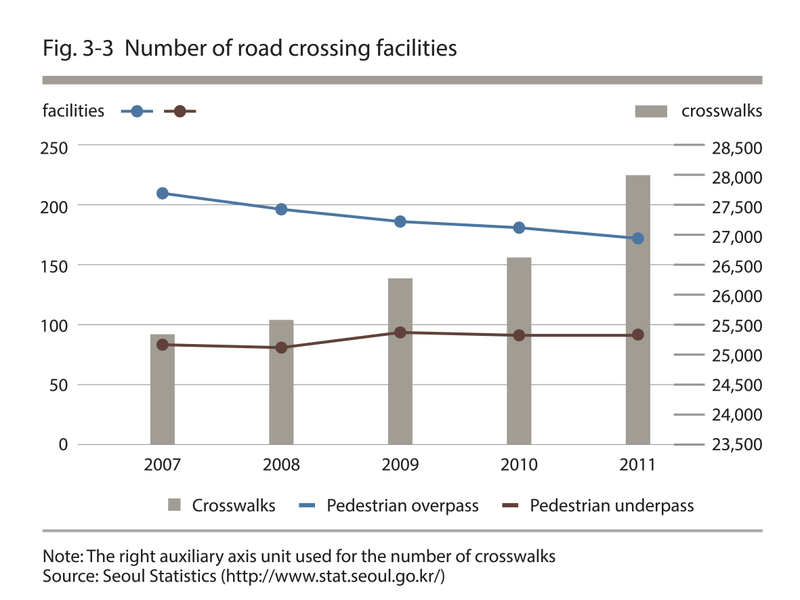 As of 2011, there are 169 pedestrian overpasses and 88 pedestrian underpasses in Seoul. The length of pedestrian overpasses has been decreasing at an average annual rate of 1.95% since 2007, while the length of pedestrian underpasses has been increasing at an average annual rate of 1.97%. 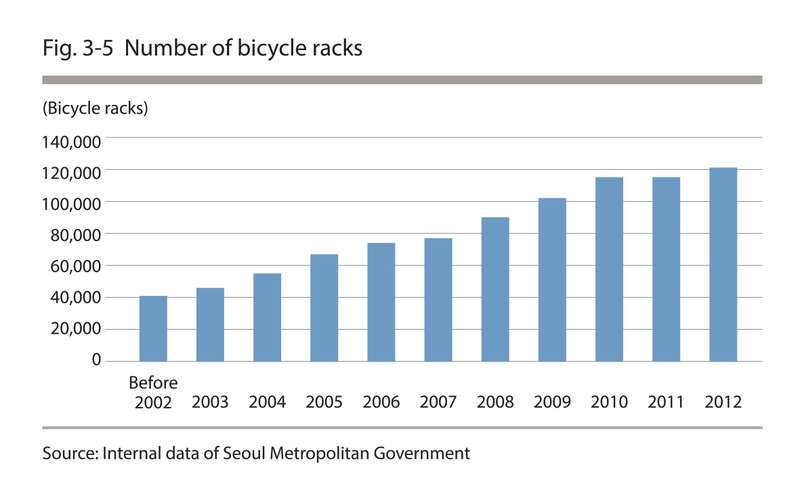 The total distance of bicycle path in Seoul has been increasing gradually to 674km as of 2012, while the total number of bicycle racks was reported to be 121,092, which was a 192% (79,581) increase from 41,511 racks in 2002. 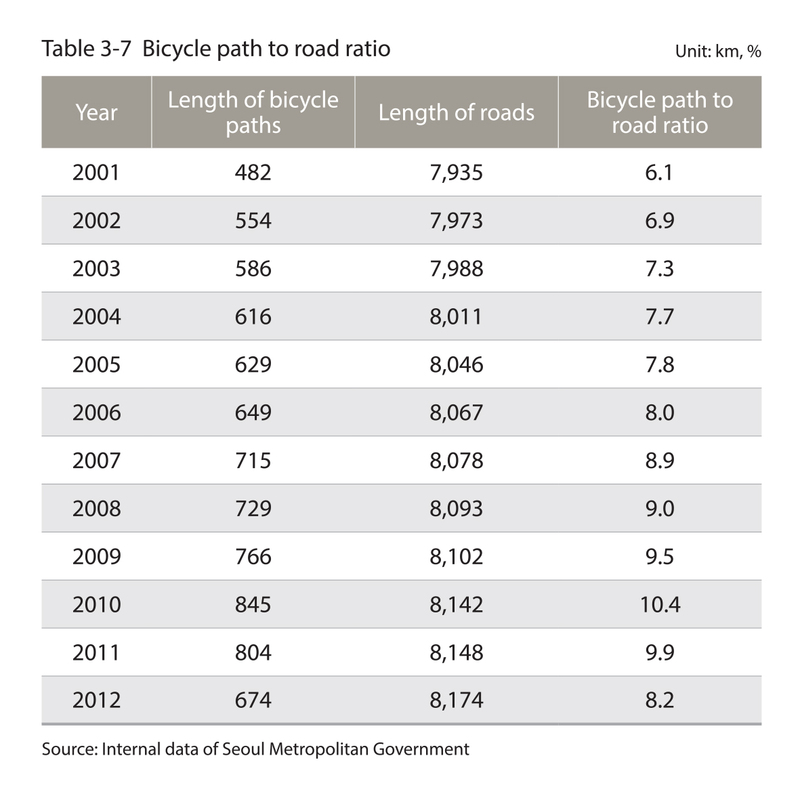 Compared to the year 2010, the distance of the bicycle paths decreased by 40.5km in 2011 as a result of the Hangang Bicycle Path Removal and Improvement Project, Road Renaissance Project, and Pedestrian and Bicycle Path Improvement Project. Also, there was a problem of redundancy in the previous calculation method; to be more specific, some of the autonomous-gu offices took into account the single-lane, bi-directional bicycle paths twice when calculating the distances of the bicycle paths, and the standards for the statistical data differed among the autonomous-gu offices. Thus, the total distance of the bicycle paths decreased once the standards for the statistical data were established to eliminate redundant data. 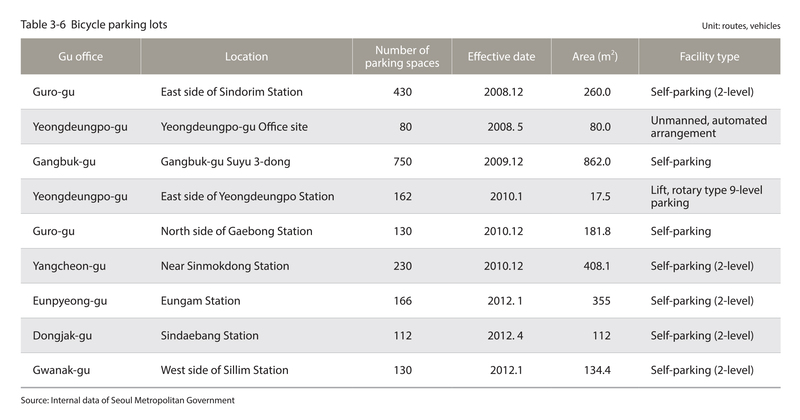 As of 2012, the 9 autonomous-gu offices of Seoul operate a bicycle parking lot each and there is enough space to park a total of 2,190 bicycles. The bicycle path to road ratio refers to the ratio of the total length of bicycle paths to the total length of roads in a given city. Bicycle paths provide convenience for bicycle users and contribute to the creation of an eco-friendly urban environment. 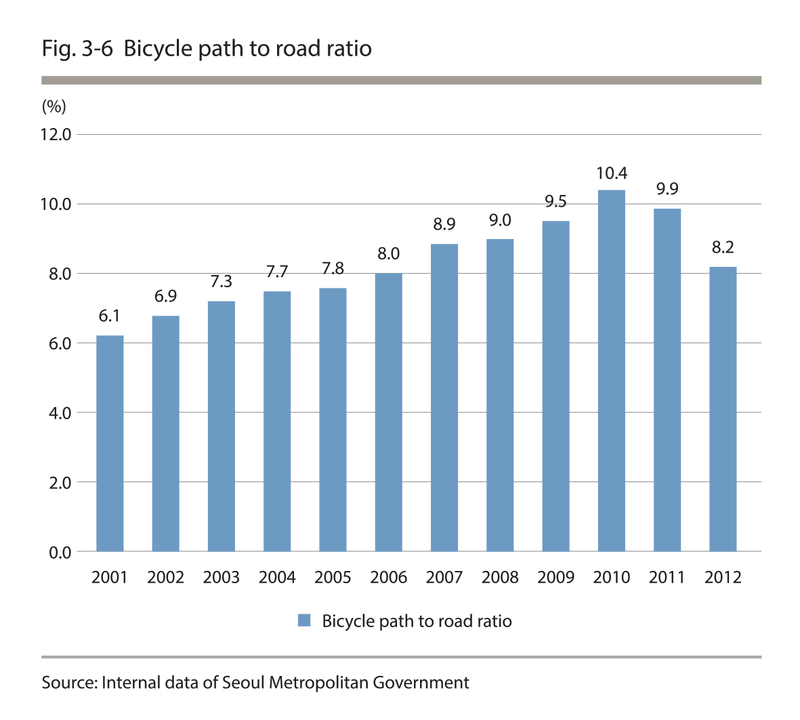 The bicycle path to road ratio for Seoul as of 2012 is 8.2%.